With the race founded in 1979 as the Busch Clash, this non-points race was exclusive to pole winners in the previous Cup series season. After the selection process was left unchanged for 22 runnings, the format radically changed in 2001 when previous event winners were also granted automatic entry. 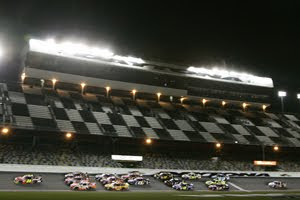 As Toyota gained ground in the series, NASCAR decided after to altered the selection of the Shootout by shining light on the 4 manufacturers in 2009. For the 2009 Budweiser Shootout, the 6th highest (7th if no championship driver is otherwise available) in owner points of each car make filled the field. Not only did this change in eligibility throw out the long-held basis on past season's pole sitters, two drivers who didn't race with their respected teams entered the Budweiser Shootout. The #12 Penske Racing Dodge as well as the #20 Joe Gibbs Racing Toyota, piloted by Ryan Newman and Tony Stewart, were driven in the race by David Stremme and rookie driver Joey Logano. In fact, if it wasn't for NASCAR's decision to add the past championship provision, Stewart wouldn't even have gotten a chance to run the Busweiser Shootout. Though the race itself wasn't terribly affected, some fans disliked the system since manufacturers like Ford and Dodge, who barely fielded 6 cars in 2009, were promoted into the race by constructor affiliation rather than individual performance. In an era where NASCAR is leaning further and further towards spec stock cars, using manufacturers standing is far outdated for a series which features race cars that maintain little identity to their stock counterparts. Current economics also made the manufacturer-based selection process problematic. This is reflected heavily in the Dodge Motorsport camp. Losing Richard Petty Motorsports to Ford, Dodge is left with only three steady cars fielded by Penske Racing. NASCAR's choice to abandoning the highly controversial manufacturer-based selection process for a system rewarding drivers' achievements will be better received by fans. Amongst what would be the most newsworthy addition under the new criteria is NASCAR Sprint Cup's 2009 Most Popular driver Dale Earnhardt Jr. Ready to put the 2009 campaign with the AMP/National Guard Chevrolet behind him, Earnhardt's position in the 2010 Budweiser Shootout was earned through past success at Daytona. The 2010 edition of the Budweiser Shootout running on February 6th will be the finale to an important day at Daytona International Speedway. Starting with Daytona 500 qualifying, these Sprint Cup racing action is sandwiched between the ARCA stock car Lucas Oil Slick Mist 200 race.